Plaid Stallions : Rambling and Reflections on '70s pop culture: Turn on today's "Turned-On" Youth! Yeah, let's dial back the concept of anybody getting "Turned on" here, Mr. catalog copywriter. The one in the middle reminds me of the Harlequins from 40K. Tucked, the only real way to wear a sweater vest. Nonsense, Anon #1. The one in the middle should remind you of a Slaaneshi cultist. He's even sporting The Prince Of Pleasure's signature colours. What a difference half a century makes. 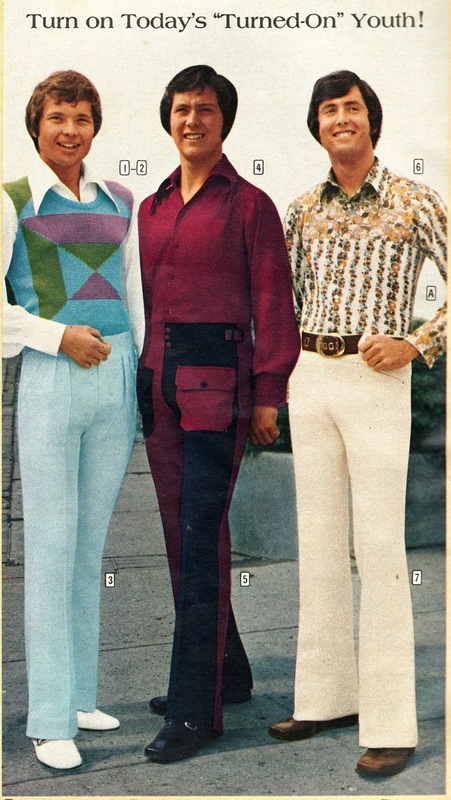 At the time, this was considered daring "counter-culture" fashion for the so-called "turned-on" young generation. The contrast between this and how "modern primitives" dress today is shocking. For starters, nothing is permanent. Yesterday's "Turned-On" Youth could (and inevitably did) get a hair-cut, change their wardrobe, and look back at photos like this with wry amusement and mild embarrassment. Today's "modern primitive" chooses more permanent forms of foolishness. It's common to see young people today sporting ear-flares, facial piercings, along with tattoos on their hands, necks and faces. It's going to take a bit more than a trip to Eddie's Barber Shop and a few selections from Mantique's "Junior Partner" line to change that sort of image. Number 6 still looks pretty good by today's standards. It's "hippie" but in a good and dressy way. Why is it that the "turned on Youth" look like they are all in their mid-30's? People looked so much older in the 70s! People did look much older in the 70s. I remember being in elementary school and all the high school boys sporting thick moustaches and looking like members of Boston. When my peers and I got to be high schoolers we still looked like snot nosed kids.